Captain Phillips is a near-perfect marriage of filmmaker and material. Paul Greengrass began his career in the world of documentaries, and both his subsequent fiction films and true-life tales have all shared the same determination to bring a sense of ripped-from-the-headlines immediacy to the story being told, to make us feel as if we are right there in the midst of the action. 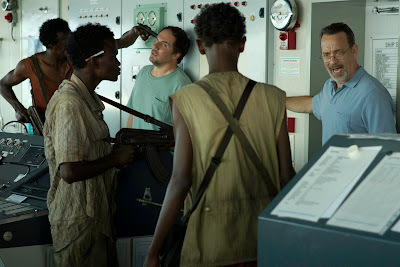 The second half of Captain Phillips largely takes place within the cramped confines of a small lifeboat, inhabited by five men – four of whom are armed – and with the tension and terror escalating with every passing minute. Some filmmakers might struggle to remain composed in such surroundings, but Greengrass is in his element. It does take a while for the picture to find its sea legs, though. The opening scenes are clunky and expositional, and I'm not sure what purpose is served by the conversation Captain Richard Phillips (Tom Hanks) has with his wife (Catherine Keener in a bizarrely negligible role) about how tough the modern world is. There's something rather lumpy and shapeless about Billy Ray's screenplay in its early stages, but the film becomes a much more engaging proposition as soon as the giant freighter ship Maersk Alabama sets sail for Mombasa. This is the ship that was boarded by four Somali pirates in 2009, leading to a tense hostage situation that was eventually resolved by the intervention of US Navy SEALs, and Ray has smartly compressed the real-life events into a gripping narrative that takes off as soon as the pirates appear. The four pirates are led by a young man named Muse, who is played by a first-time Somali-born actor named Barkhad Abdi. Gaunt and watchful, Abdi is a mesmerising screen presence, exuding a sense of fearlessness and menace as soon as he steps on board the ship, and engaging in some absorbing one-on-one standoffs with Hanks. The film draws parallels between these two captains, one young and one old, from vastly different backgrounds, and both trying to gain the advantage in this life-or-death power struggle. The first half of the film plays as a game of cat-and-mouse, as Phillips attempts to improvise ways to distract the pirates, and to protect his crew who are hidden in the tanker's various dark corners, while Muse's suspicion increases and the anger of his fellow pirates grows. Hanks and Abdi make their confrontations sizzle, but the film still lacks the sense of intimate danger and urgency that I was anticipating. Captain Phillips really finds the unpredictable explosiveness that defines Greengrass at his best when the captain is taken hostage by the pirates in that tiny vessel, and the hyperactive handheld camerawork of Barry Ackroyd makes us feel the desperation and knife-edge tension within that location. Working seamlessly together, Greengrass, Ackroyd and editor Christopher Rouse create a sense of chaos while never allowing us to lose our sense of what is happening to whom, and where. In the second half of Captain Phillips, Greengrass orchestrates action both within the lifeboat and on the deck of the warships from which the Navy will launch their assault, and with each cut he ratchets up the tension and emotion. A lot of the film's emotion comes from Tom Hanks too. His performance here presents Captain Phillips as a pragmatic, resourceful individual whose mind is always racing to analyse a situation and work out what the best course of action might be. Even when he is in a high-pressure situation, with a gun pointed at his head and people screaming at him from every angle, we can see Hanks' mind at work behind his eyes – looking for a strategy, pondering the right words to say, figuring out how to survive. 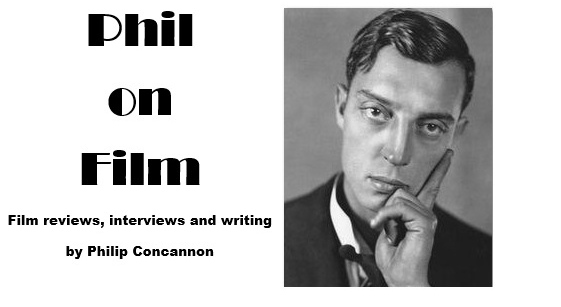 However, all of Phillips' experiences gradually take their toll and the cumulative emotional weight of what he has been through eventually spills over in the film's final five minutes, in one of the most extraordinary pieces of acting Hanks has ever produced. It is this climax that elevates Captain Phillips from an exemplary piece of thriller filmmaking into something much deeper and more resonant.